- Use 2 Galactic Grip-Tite Hangers, one as your stabilizer, if you requirer an exact match (purchase 2 for banner). 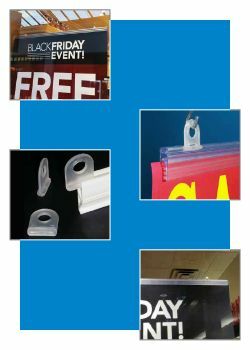 This ceiling display system is among the most versatile in our line of sign holders. It's so simple to use and can handle the most commonly used banner materials you will find in retail environments. We call it "grip tite", because it will certainly hold the banner in place and "galactic" because its not one of the ordinary banner hangers. Minimum quantity for "22" Galactic Grip-Tite™ Banner Hanger, GAL-700" is 10. Minimum quantity for "24" Galactic Grip-Tite™ Banner Hanger, GAL-701" is 10. Minimum quantity for "36" Galactic Grip-Tite™ Banner Hanger, GAL-702" is 10. 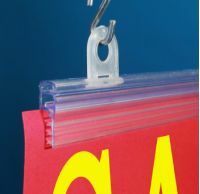 Minimum quantity for "48" Galactic Grip-Tite™ Banner Hanger, GAL-703" is 10.